which means if you aren't leveraging that, then you are losing out. Actively engaging with your Facebook followers & getting reviews for your business is one of the easiest ways to grow your business! Facebook Business Page Management made simple. Save time, generate more likes and consistently post quality content to your Facebook Page that engages your customers and keeps them coming back for more! Having a Facebook Page for your business is important – we all know we need one. Keeping up with it and learning all the ins and outs on how to manage it to effectively generate you business is a bit harder to swallow. Many of us (raises hand) are guilty of creating a Facebook page with all of the best intentions and then barely posting to it. Some of us reason it’s time consuming and they get busy or forget. Others fall off the grid because they don’t really know or understand how Facebook Business pages work and it’s another complicated ‘web’ thing to learn. And some don’t even bother making one because they simply don’t know how. Bottom line: We know we can make more money with a Facebook Page but it’s overwhelming to manage & keep up with it in our busy lives. Our Social Media Manager is a seasoned Facebook PRO! She can manage & monitor your page while you are out doing what you do best – Selling Real Estate! We have several of packages to choose from to suit your needs from simply posting so your Facebook feed always has interesting content to capture and engage your audience to posting, moderating and seeking building your audience! So whatever level you are at, we can accommodate you now and down the road as you grow! Check out the packages listed below and choose the one that works best for you! 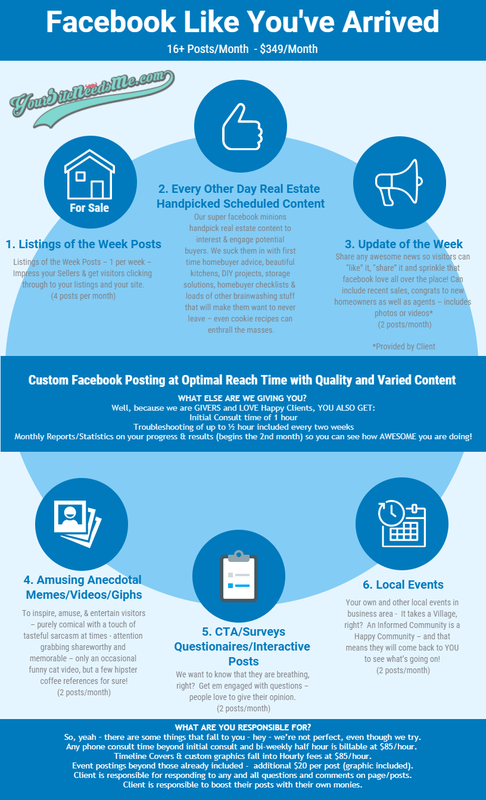 Choose the real estate Facebook Page Management package that works best for you! Pick a package below to subscribe. There are no obligations or contracts! Once you have completed the purchase via PayPal, you will be immediately redirected to our Honey Do List where you can provide us with the information we need to begin.